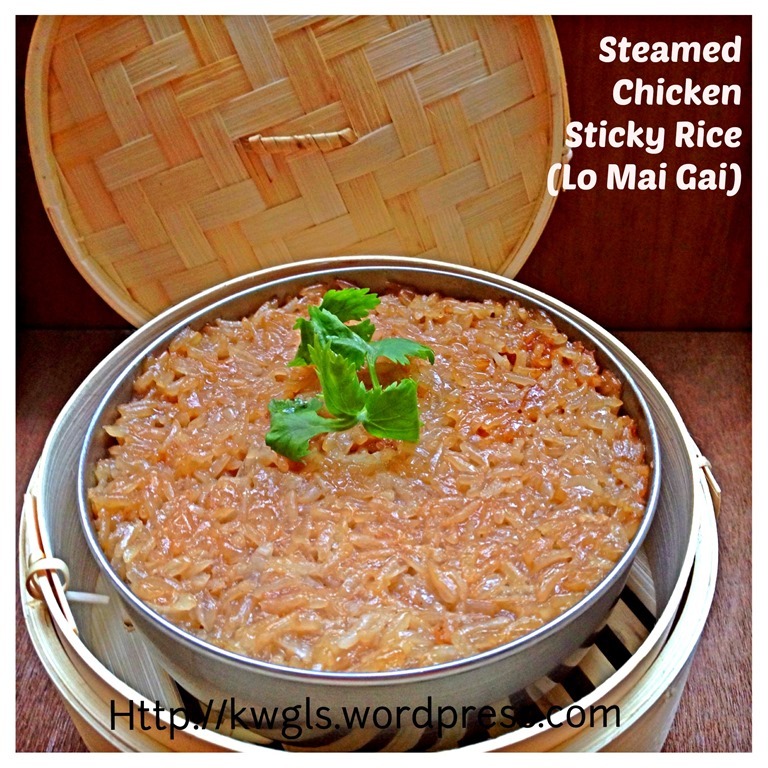 I am not familiar with Lo Mai Gai as it is not my dialect’s cuisine.. It is a Cantonese cuisines. 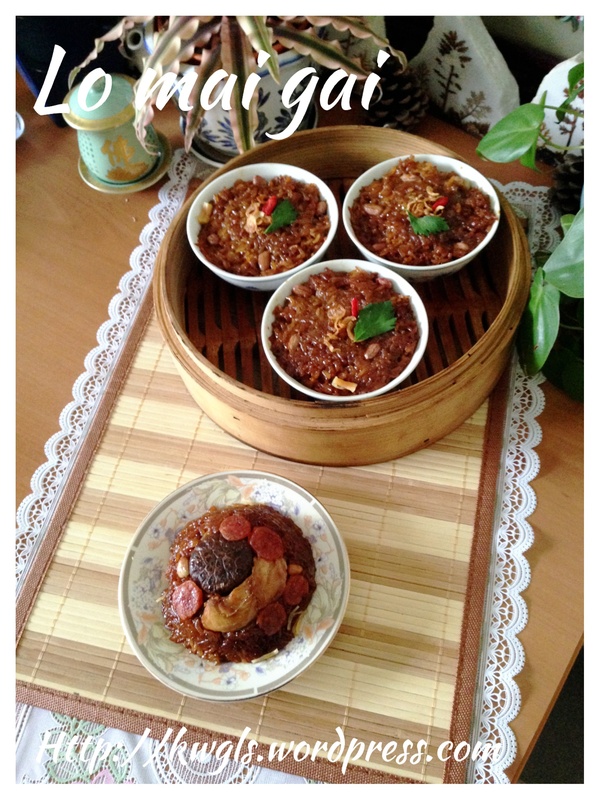 I only tried Lo Mai Gai in dim sum restaurants and most of all, at the hawker’s centre in Kuala Lumpur. It was usually served in aluminium foil cups and sold together with the steamed buns (pao’s). Possibly because it is constantly re-steamed, the Lo Mai Gai that I know is very soft and at time watery with meat and vegetable juices.. I do prefer this softer type with some gravy as compared to the dry Lo Mai Gai usually sold in the dim sum restaurant.. Kids loved this version too.. Therefore in my re-steaming, I have purposely add in more chicken stock to make it softer and with some juices..One reason was for my kids and another reason is because I find that it is more tasty.. The original Lo Mai Gai in dim sum restaurant is definitely not soggy, taking picture in the evening also contribute to the ugly picture. 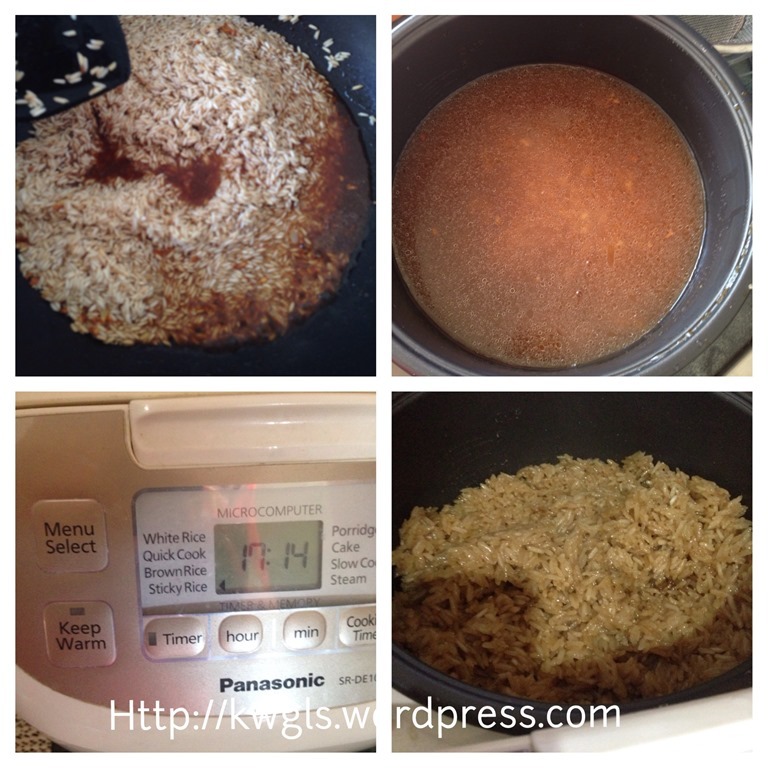 This is a very fast way of cooking, of course, with the use of the rice cooker. It took me about 1.5 hours to cook this.. No soaking of rice overnight, since rice, sausages, mushrooms were cooked, steaming only provide better binding and cooking the chicken. Depending on what type of glutinous rice texture you want, if you want a softer texture, you can steamed 5-10 minutes more. However, it is generally agreed by foodies that the glutinous rice should be grainy, soft but not soggy. 5 winter mushrooms – soaked and diced into small pieces. 3 cm long ginger squeezes into juices. 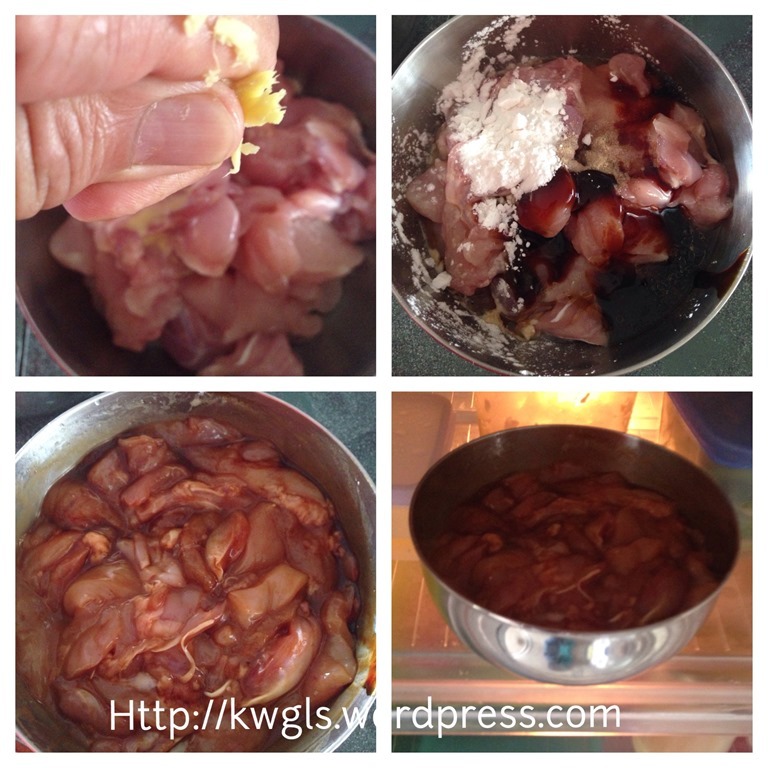 Pound the ginger and squeeze the ginger sauce to the chicken. Put in all meat and mushroom marinating ingredients. Stir until well mixed. Marinate for at least 1-2 hours. While marinating the meat, wash the rice and add in dark soya sauce, chicken stock, oyster sauce, white pepper and light soya sauce. 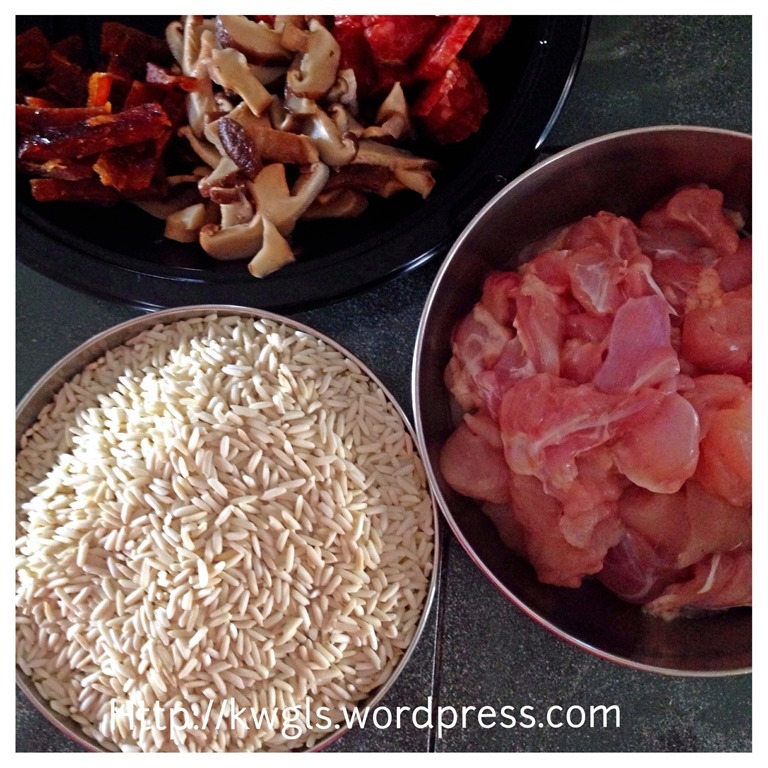 Marinate the rice for 5-10 minutes. In this way, it is easier for you to “colour” the rice with soya sauce. In a frying pan, sauté the minced garlic until fragrant and brownish, add in the glutinous rice and stir fry until well mixed. 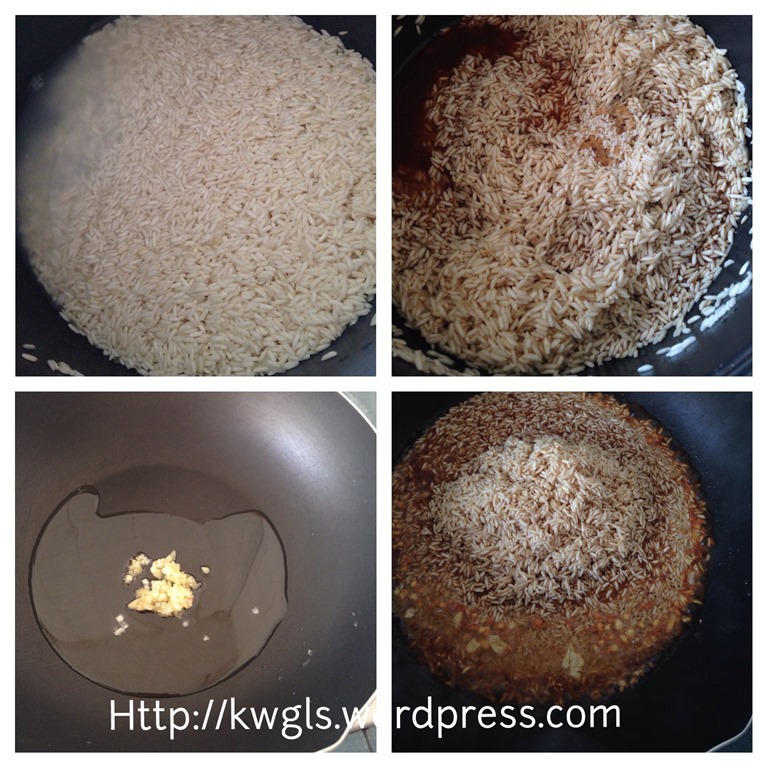 Transfer the fragrant uncooked glutinous rice to the rice cooker, add adequate cups of water as per the glutinous rice packaging instruction (I used about 3 cups of water with 3 cups of glutinous rice), select sticky/glutinous rice function. In between the cooking, stir the glutinous rice to ensure that the top part of the rice is equally cooked and there is no burnt rice at the bottom of the rice cooker. Meanwhile, grease your preferred steaming bowl or aluminium foil pie cups, layered the marinated chicken meats and mushrooms. Add in the Chinese sausages and/or Chinese pork jerky. 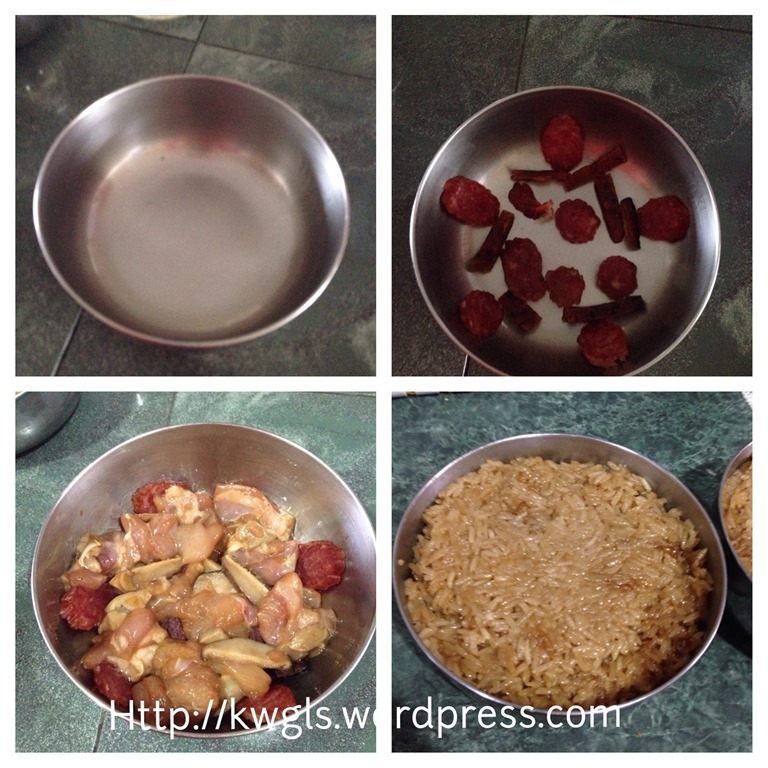 Cover the meat with the cooked glutinous rice. Press it as compressed as possible…Steamed in the steamer for 15-20 minutes or until your desired texture. 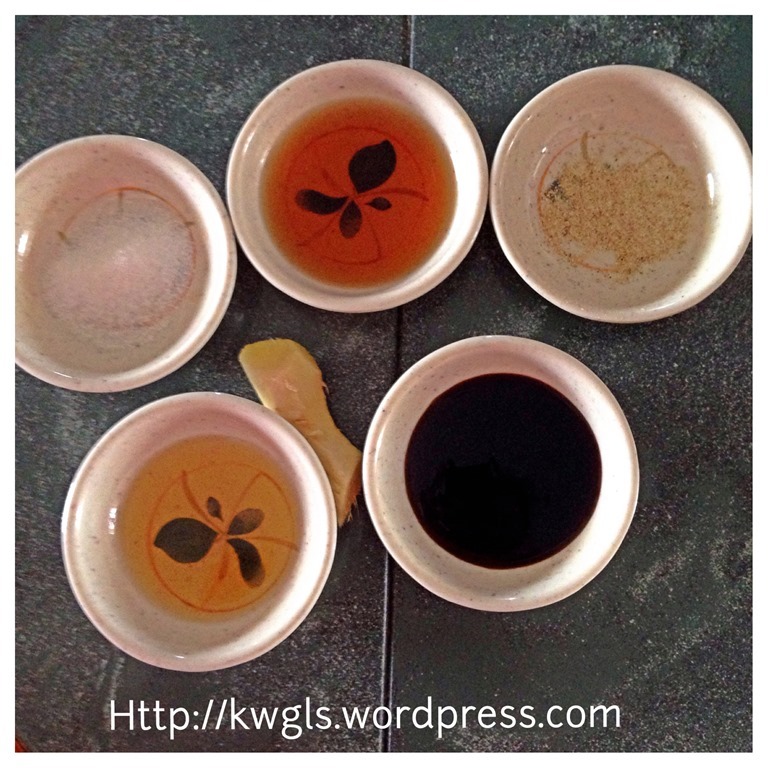 For servings, when warm , overturn the bowl and let the Lo Mai Gai sit in a serving plate. 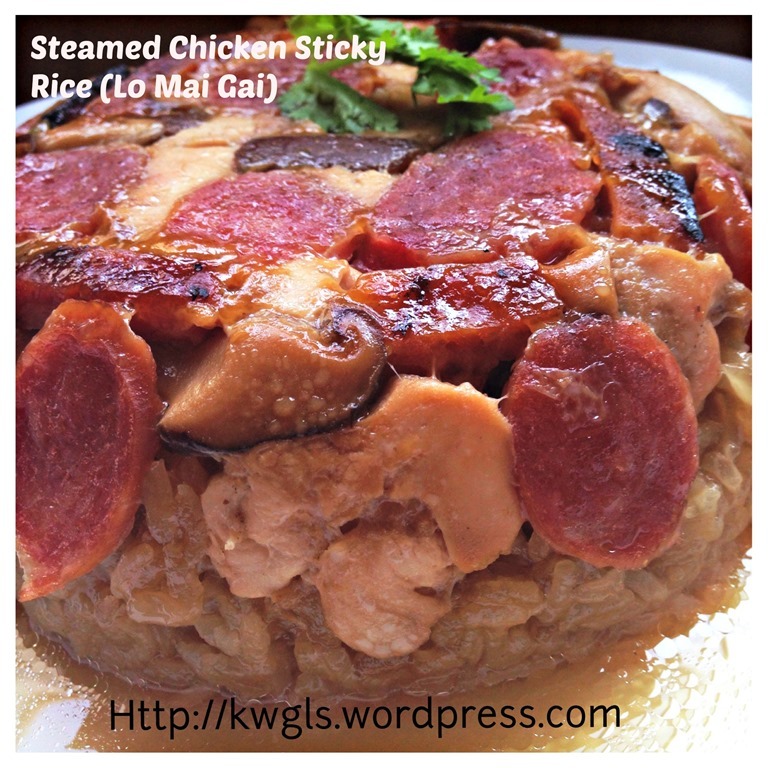 Pardon me for the wet rice as I have purposely did it for my kids who prefer very soft or gluey glutinous rice. I concurred as it is easier for the kids to digest. This cut short method made it possible for me to prepare this dish in about 1.5 hours. May be you want to give it a try. 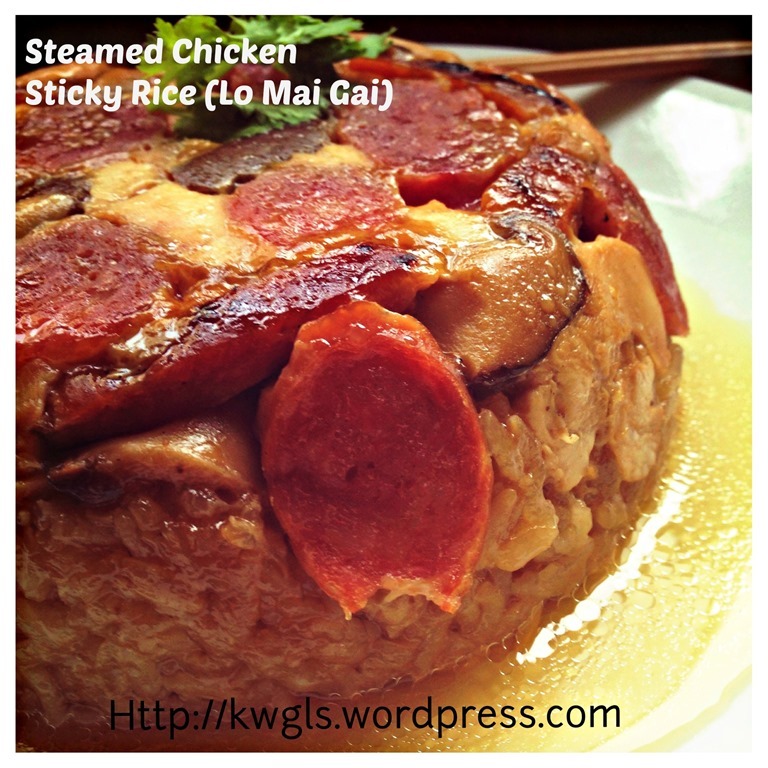 This entry was posted in Chinese and Asian Cakes and Snacks, Food Preparation Series, Noodles, Rice and Others and tagged 糯米鸡, GUAI SHU SHU, Guaishushu, kenneth goh, lo mai gai, lo mai kai, postaday, Steamed chicken sticky rice. Bookmark the permalink. Adeline, you can try one cycle first. After one cycle, if it is too hard, add a bit of water and continue the second cycle. My experience is it will take about 1.5 cycles. Therefore, you have to check on the second cycle and off the electricity when it reach your desired texture. Of course soaking will help and if you have time, please do. Your recipe calls for mushroom sauce and also oyster sauce. I never know what is mushroom sauce. Any household name for this sauce? 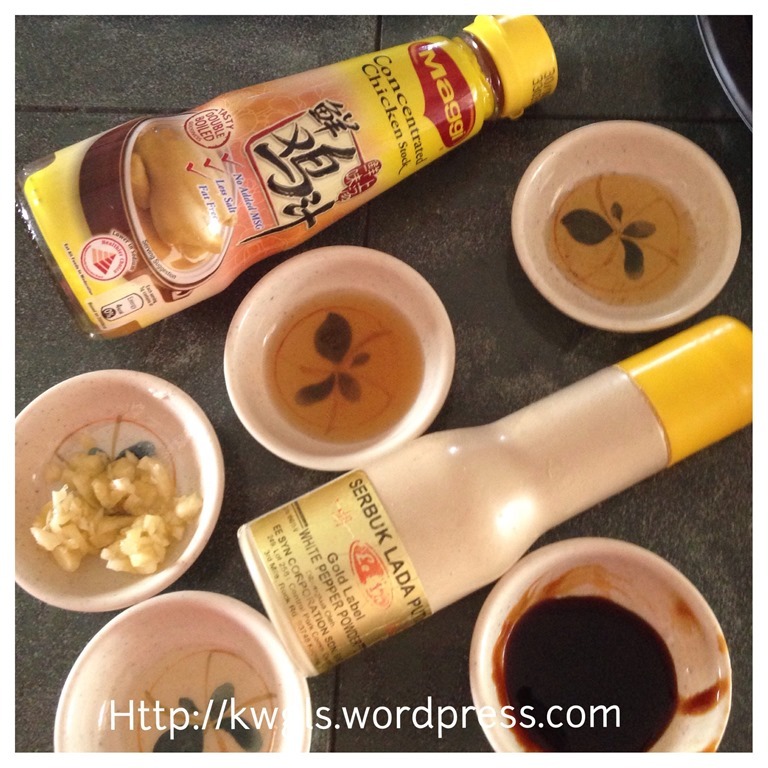 At home, I use vegetarian oyster sauce which is actually made from mushrooms. May i know when marinating the meat & mushrooms, is there dark soya sauce to add on? Because you didn’t indicate any dark soya sauce but i could see a bowl of black sauce. yes, you can add dark soya sauce.